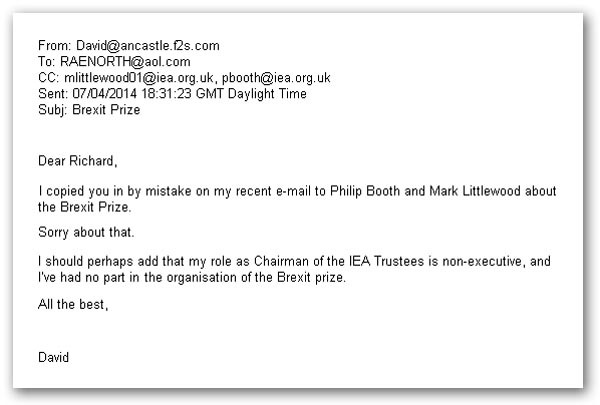 I spent most of yesterday corresponding with Philip Booth of the IEA, trying to ascertain from him why the Brexit prize competitors were given a set of very explicit instructions, while their submissions appear to have been judged on very different and hitherto undeclared criteria. I tested my correspondence out on a few friends, just as a check, to make sure I wan't being too hard. Although it was evident I am angry, the tone was described as "measured". Amongst other things, I had wanted to know why the rules had also been changed so that a new short-list of six had been created, after the submission deadline. The particular interest for the competitors not shortlisted (and there are a number of us thus concerned), is that the IEA is making a public statement that there are at least six better submissions than ours. For me - I would not presume to speak for the others - I regard that as "professionally damaging". And it was not something any of us signed up for. Anyhow, as the exchanges multiplied through the day, it was evident that I was getting nowhere. Eventually, in the early evening, I brought the exchange to a halt, without having achieved anything at all, not the slightest concession, nor scintilla of understanding. The thing about these exchanges, though, is while you are getting the polite brush-off, you rarely get an inkling of what they are really thinking. But, while Booth had asked for a private exchange, he was in fact copying in colleagues and sundry others. At his end, the exchange was anything but private - it was being broadcast throughout the IEA. They might just as well have put it on the Tannoy. Then I received yet another e-mail, one with the same header used for the Booth correspondence, but from a different address, one [then] unknown to me. The writer, incidentally, had copied his reply to two others (text published below), the content providing the IEA's "Ratner moment", that brief insight of their inner thoughts, which reveals the contempt they really have for us. 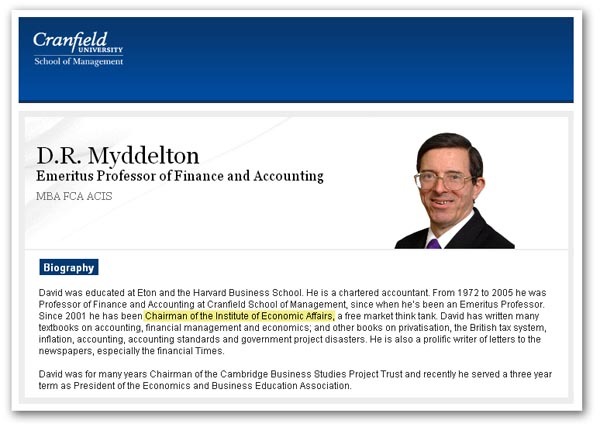 The e-mail, it turns out, was from professor emeritus David Myddelton of Cranfield University, educated at Eton and Harvard Business School. His cv (top) says he has been chairman of the IEA since 2001. Although he is a reasonably frequent speaker on the "eurosceptic" circuit, he is obviously no great fan of yours truly, although I cannot think of anything specific I've done to offend him. Nevertheless, thanking Booth for sending our correspondence to him, he grandly declared that: "Richard North's attitude is disappointing". Then says the professor emeritus, a man who obviously must know about such things: "He has written on this and similar topics so much that I cannot believe he spent a huge amount of time on his entry". So, this is the first stage of the standard denigration technique: "North" can't have spent much time on his submission so [implied] it was probably crap anyway. Then the boot goes in. My "measured" tone reminds the revered professor "of my ten-year-old grand-daughter – who likes to boast that she did very well on an exam, before the results indicate that she scored, say, 10/40!" Does this run in the family? One can only wonder. But, from his careful and measured study of the evidence, there comes the learned professor's considered view of the entire issue: "It is not North's failure to be judged to have finished in the top six entries that might hurt his 'professional reputation'", declares the great professor, "but his petulant and bad-tempered response to the result". He should have bent over and taken his punishment, is the sub-text. Then the knife goes in, making it clear they are not actually going to address any of the points "North" makes. Oh no! 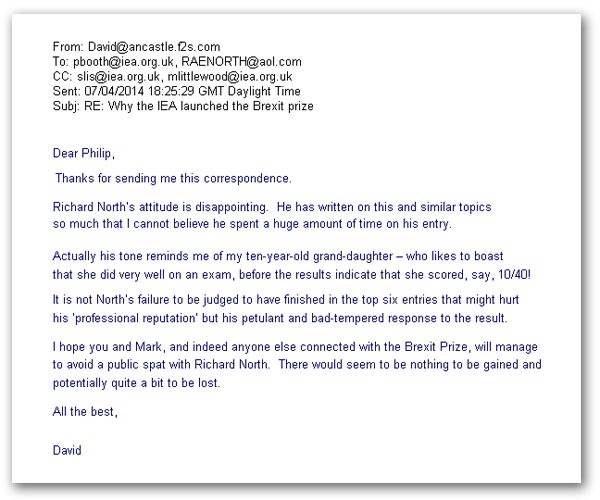 Says Myddelton: "I hope you and Mark [Littlewood, IEA director general], and indeed anyone else connected with the Brexit Prize, will manage to avoid a public spat with Richard North". "There would seem to be nothing to be gained", Myddleton adds, "and potentially quite a bit to be lost". We would not, after all, want to concede that he might have a point, so let's not give him any opportunities, is the sub-text here. We couldn't possibly have him be seen to be right. "Dear Richard", he writes. The man doesn't know me of course, and we've not been introduced. But from his lofty, above-the-line-stance, peering down at his inferiors, there is no "Dr North" here, just a "Richard". One can then only imagine the embarrassment as he tells me: "I copied you in by mistake on my recent e-mail to Philip Booth and Mark Littlewood about the Brexit Prize". We don't get an apology for the insults, mind you. Just, "Sorry about that" - sorry I've been caught out insulting you..
Then we get to the real reason for the e-mail - a necessary disclaimer: "I should perhaps add", he says, with feigned casualness as he does a quick underpants change, "that my role as Chairman of the IEA Trustees is non-executive, and I've had no part in the organisation of the Brexit prize". And then, a final hypocritical flourish: "All the best, David". Well, cheers Dave! I actually spent over 700 hours on researching and writing the submission, with personal visits to both Norway and Iceland, where I interviewed senior politicians, trade representatives and others, to give first-hand information to go into the report. But, Dave, you are also dismissing a huge amount of time put forward by EU Referendum readers, and the huge help given by The Boiling Frog and others, who were also just as keen to have a fair competition, those whom you have now so casually insulted. But that doesn't matter - they're only plebs who didn't go to Eton. Despite that, I then wrote to him about the submission of which he had been so dismissive: "You will not have read it of course", I ventured. These very clever people never do ... they have the wonderful gift of divining the quality of such things without needing to read them. Thus, I observed: "You are undoubtedly far too clever and grand and could not be expected to soil your magnificent brain with such material". And we couldn't have him actually learning anything. "However", I added, "I must really thank you for such an illustrative example of what the other half think of us plebs. I am sure my readers are going hugely to enjoy your perceptive analysis". Compare and contrast this with what they were saying to my face. Isn't it refreshing when the mask slips and you find out what they really think about you, and what they are really saying! For all their airs and graces and their fine words, the truth will out. But how sad, the message is always the same: "know thine place, pleb!" Whatever did we do before the internet, and learned professors who press the wrong buttons? But whatever made me think I was ever going to get a fair deal from the IEA? At least we got their "Ratner" moment, when we learned what they really think of us.